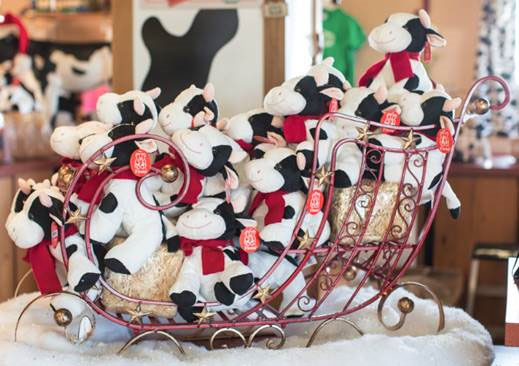 Shamrock Farms, Arizona’s hometown dairy, will be transforming its working dairy farm and tour into a winter wonderland as they host their annual “Joy to the Herd” holiday celebration the first weekend in December. Families won’t want to miss out on the chance to not only meet the cows that make Shamrock Farms dairy products so pure and fresh, but also participate in fun holiday activities at an affordable price. In addition to being able to get up close and personal with 10,000 cows on the guided tour, the event includes special added features including 15 tons of snow shipped directly from the North Pole, holiday crafts, face painting and more. Of course, no holiday celebration would be complete without a special visit with Santa and Shamrock Farms own jolly spokescow – Roxie! The holiday cheer continues with festive décor added to Shamrock Farms Welcome Barn and tram as well as throughout the fun and educational guided Farm Tour, which takes visitors through a milking barn that accommodates 1,600 cows (milking 200 at a time), an interactive play zone, a calf nursery and much more. Friday 12/1 tours – no snow. Tickets are $12 for children and adults and include all activities. Sat. 12/2 and Sun. 12/3. Tickets are $15 for children and adults and include all activities. No long wait lines or paid packages for visits with Santa – included in admission price. Children under 2 are free. Lunch will be available for an additional cost. To book your reservation today or for more information visit www.shamrockfarms.net or call 602-477-2462.